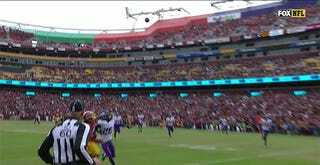 This outstretched one-handed falling grab right on the sideline by Washington’s Maurice Harris initially looked like an impressive failure, with the play ruled out of bounds. But on further review, the catch was good, and Harris had come down with one of the best plays of the year. That’s Harris’s first career NFL touchdown. Sorry, but it’s probably all downhill from here.